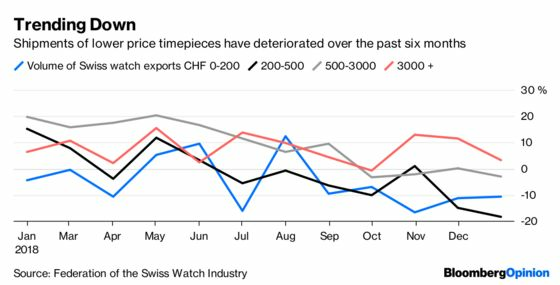 (Bloomberg Opinion) -- The Swatch watch is unwinding. The Swiss manufacturer of its namesake brand and higher-end timepieces such as Harry Winston is facing twin pressures: from exposure to China and consumers’ increasing acceptance of smartwatches. The company on Thursday reported worse-than-expected 2018 sales and profits. It was hurt by a slowdown in China in the final three months of the year, as well as production bottlenecks in the popular Omega and Longines brands. The shares fell about 5 percent. While some luxury players, including LVMH, have said that China is holding up, or even improving, that doesn't seem to be the case in watches. Swiss exports to China fell 10 percent in December, a worrying sign for the industry. Swatch is particularly vulnerable – some 35 percent of revenue was generated from Greater China in 2017, according to Bloomberg data. But there is another threat. 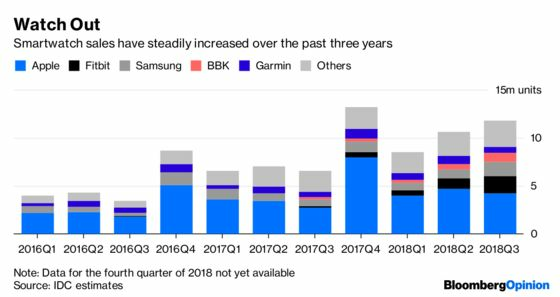 In 2018, the annual volume of the devices sold by Apple Inc. might have matched or even exceeded that of the entire Swiss watch industry. The competition has already eaten into the nation’s exports of lower-priced timepieces. The situation is about to get worse. Swatch has so far been able to keep the threat from smartwatches at bay. But Silicon Valley is ramping up its efforts. Watches have offered Apple a glimmer of optimism as iPhone sales tumble. Although the Cupertino, California-based company doesn’t break out unit sales, the revenue from its Wearables, Home and Accessories vertical, which also includes the HomePod smartspeaker and AirPod earphones, jumped 33 percent in the three months through December. A revamped version, the Watch Series 4, was released in September, prompting GQ magazine to declare “it’s finally time to buy an Apple Watch.” The marketing message for early iterations of the device was confused: it was pitched as both a fashion accessory and a fitness device. Apple has now focused on health and fitness, and has actively targeted the middle of the market. The sales momentum from the end of last year looks, at the very least, set to continue. The product has also become an important tool for tying iPhone users to their handsets. This explains why Google spent $40 million earlier this month to buy staff and intellectual property from smartwatch-maker Fossil Group Inc. The Alphabet Inc. unit has a growing hardware division making Pixel phones and other products. Offering its own wearable would be a way of locking customers into its other devices. With Thursday's tumble, Swatch shares are down 43 percent since June. They trade on a forward price earnings ratio of 14 times, compared with Richemont's 18 times. That discount looks justified. Although Swatch said its lower and mid-priced products performed well in 2018, it has more to lose than Richemont on this front. It generates 27 percent of its sales from watches priced at 500 Swiss francs ($503) or less, according to analysts at Morgan Stanley. Its rival gets just 7 percent from this category. 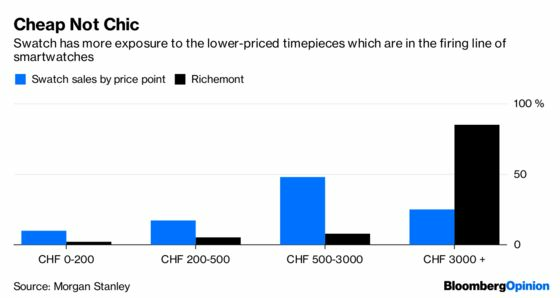 And while the slowdown in the Chinese wholesale market is also negative for Richemont, it has been proactively managing its supply into that market for the past few years. Its greater exposure to high-end timepieces and jewelry also bolsters its protection from the current threats. Swatch has built exposure to more expensive models and is developing its jewelry arm. It is also working on its own connected devices in an attempt to compete with Silicon Valley. But that may not be enough to see off the twin threats of Apple aggression and a Chinese hard landing. Three years ago, Swiss manufacturers mocked the Apple watch. Now, they are no longer laughing. And the irony will be even greater if they have to deal with Chinese consumers turning off of their brands, too.